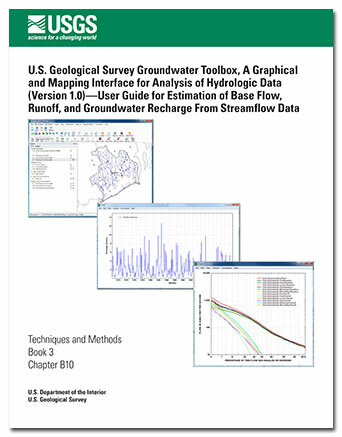 This report is a user guide for the streamflow-hydrograph analysis methods provided with version 1.0 of the U.S. Geological Survey (USGS) Groundwater Toolbox computer program. These include six hydrograph-separation methods to determine the groundwater-discharge (base-flow) and surface-runoff components of streamflow—the Base-Flow Index (BFI; Standard and Modified), HYSEP (Fixed Interval, Sliding Interval, and Local Minimum), and PART methods—and the RORA recession-curve displacement method and associated RECESS program to estimate groundwater recharge from streamflow data. The Groundwater Toolbox is a customized interface built on the nonproprietary, open source MapWindow geographic information system software. The program provides graphing, mapping, and analysis capabilities in a Microsoft Windows computing environment. In addition to the four hydrograph-analysis methods, the Groundwater Toolbox allows for the retrieval of hydrologic time-series data (streamflow, groundwater levels, and precipitation) from the USGS National Water Information System, downloading of a suite of preprocessed geographic information system coverages and meteorological data from the National Oceanic and Atmospheric Administration National Climatic Data Center, and analysis of data with several preprocessing and postprocessing utilities. With its data retrieval and analysis tools, the Groundwater Toolbox provides methods to estimate many of the components of the water budget for a hydrologic basin, including precipitation; streamflow; base flow; runoff; groundwater recharge; and total, groundwater, and near-surface evapotranspiration. Barlow, P.M., Cunningham, W.L., Zhai, Tong, and Gray, Mark, 2015, U.S. Geological Survey groundwater toolbox, a graphical and mapping interface for analysis of hydrologic data (version 1.0)—User guide for estimation of base flow, runoff, and groundwater recharge from streamflow data: U.S. Geological Survey Techniques and Methods 3-B10, 27 p., https://dx.doi.org/10.3133/tm3B10.